Umbriano pavers are smooth and precisely cut with a distinctly up-market appearance, owing to their granite-like finish. ColorFusion Technology from Unilock is used to achieve spontaneous color gradients and flecks of pigment that allow Umbriano pavers to mimic the appearance of natural granite. Their unique color gradients assemble to create intricate surfaces with visual highs and lows. 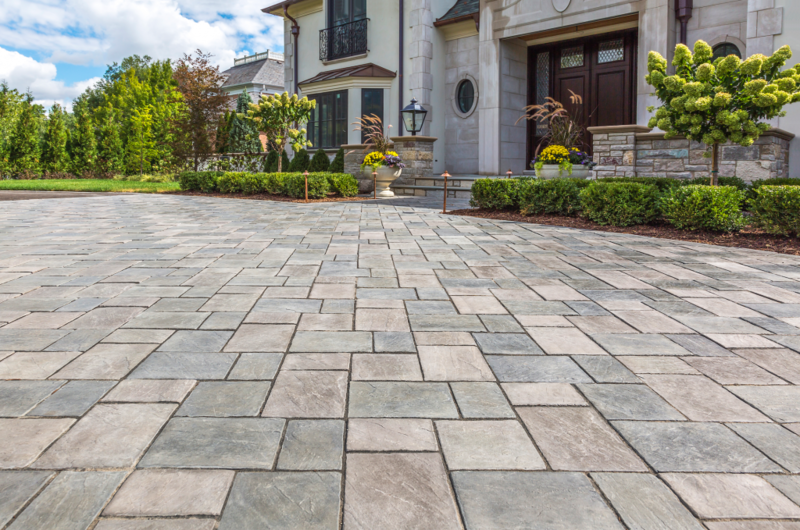 This quality is perfectly suited to driveways, which are often so large that they can look monotonous. Umbriano is available in the varying grey shades of Midnight Sky, Winter Marvel and French Grey. Artline pavers offer a variety of grey tones, including French Grey, Steel Mountain, Winter Marvel and a two-color blend of these grey shades that is done on-site. The intricate differences between each shade are guaranteed to remain clear and vibrant over time, as Artline pavers are imbued with the renowned Unilock EnduraColor FaceMix Technology. This manufacturing process turns out pavers that are highly resistant to fading despite their constant exposure to UV rays and wear. Promenade Plank Pavers feature a long, slim and precise format that is perfectly suited to making driveways appear longer or wider; both effects can be achieved depending on the direction in which the pavers are laid. They are also available in a range of finishes, including the smooth Umbriano finish and a rugged Il Campo finish. Combining Promenade Plank Pavers with different textures into the same driveway design can create a subtle yet notable contrast. While textural contrasts are less obvious than color contrasts, they can add life and personality to a paved surface. Promenade Plank Pavers and the effects that can be created by combining its various available finishes are ideal for creating a modern driveway with character. Richcliff pavers are an excellent substitute for natural bluestone, with added benefits. While some variations of natural stone aren’t strong enough to accommodate vehicular applications, Richcliff pavers are reinforced by Ultima Concrete Technology and bear up to four times the strength of poured concrete. The Dawn Mist and new Smoke Shale shades offer stunning cool greys that are made more captivating by the embossed surface texture of these pavers. Series pavers feature a combination of refined granite and quartz aggregates and are hard-wearing and fade-resistant. This makes them excellent candidates for driveways and other areas that frequently experience heavy loads. In fact, they are often relied upon to create attractive commercial hardscapes that will not only make a good impression but will also stand the test of time. The Peppered Granite color variation is light and vibrant with a washed surface texture. This allows it to create lively open spaces that are inviting and sophisticated. The title image features a Richcliff driveway.